Welcome to the world Freddie Jack! 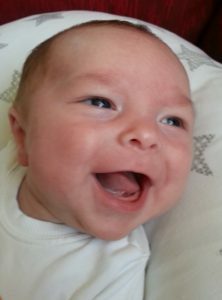 This beautiful baby boy is the first to be born following IVF treatment at Bourn Hall’s new satellite clinic in Wickford, Essex. 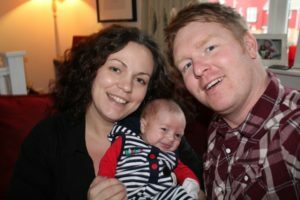 Freddie’s birth in November was an early Christmas present for proud parents Ashleigh and Darren. “I was at a baby shower in Romford for my cousin when my waters broke… It was more of a shower than we were anticipating!” Ashleigh explains. The couple started trying for a baby shortly after they married in July 2009. After three years without success, they went to see their GP, who referred them to Southend Hospital for tests to try and establish the cause of their infertility. The tests showed that Darren had a low sperm motility which was preventing them conceiving naturally. The couple were eligible for NHS-funded treatment and chose Bourn Hall Clinic Wickford because it was close to where they lived. Things moved quickly for Ashleigh and Darren as there is no waiting list at Bourn Hall for IVF in Essex on the NHS or self-funded treatment. The couple went for their initial consultation at Wickford on Valentine’s Day and their IVF journey began just four days later on 18 February 2013. The Wickford clinic opened in January 2013 to provide better access to IVF services for patients living in south Essex. A woman undergoing fertility treatment needs regular monitoring and the satellite clinic means couples living in the area do not have to travel far for check-ups. Ashleigh attended the Wickford clinic for her scans and blood tests and says the convenience of having the clinic on her doorstep meant less disruption to her work as a teacher of children with special needs. “I could pop in first thing for my tests and be back to work by 10am. It worked well for me and meant less disruption to my students and the other teaching staff. I don’t know what I would have done without the Wickford clinic as it made life so much easier,” she adds. The couple travelled to Bourn Hall’s Cambridge clinic to have a procedure called ICSI (intracytoplasmic sperm injection), where a single sperm is injected directed into an egg to fertilise it. After five days developing in the incubator, one of the resulting embryos was transferred into Ashleigh’s womb. The couple had to wait two weeks before Ashleigh could take a pregnancy test. “I was nervous, nervous, nervous!” she recalls. “Darren was with me as I took it and when we saw it was positive I burst into tears! Darren started jumping round the house in celebration, we were so happy. “Freddie is everything we could want and more. People say he looks just like Darren and we think he’s going to grow up to be a cheeky little chappy,” she beams. Welcome to the Bourn Hall Wickford babies! More than a hundred couples have been referred to Wickford since it opened and staff are thrilled the clinic is proving so successful, with a clinical pregnancy rate consistently above 50%. Along with Freddie, the team have also welcomed Amelia Rae Ott into the world, the first Wickford baby girl born to parents Amanda and Chris on 10 December 2013. Sarah Pallett, the regional clinic manager for Bourn Hall in Colchester and Wickford, says she could not be happier for both families. Our heartfelt congratulations to Ashleigh and Darren, and Amanda and Chris, who have achieved their parenting dream with a little help from the expert team at Bourn Hall. Bourn Hall’s Wickford Clinic helps to provide IVF in Essex – find out more about your local, convenient clinic here.